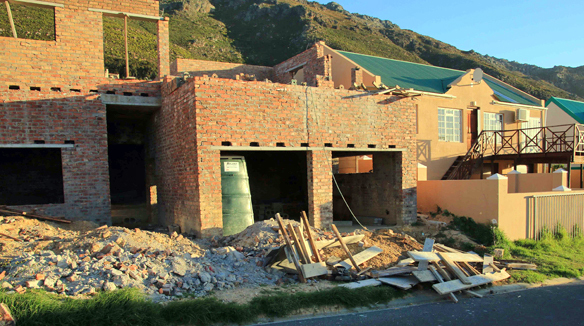 The City of Cape Town recently ordered builders to halt construction of a Gordon’s Bay house because the project did not comply with the National Building Regulations (NBR). In fact work has been stopped several times, and only after repeated complaints over a period of months. This in spite of the fact that excavations had undermined a neighbour’s boundary wall; a gable wall had previously collapsed on the site; and building was not according to approved plans. 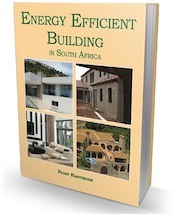 SANS10400.co.za has no affiliation with the SABS that produces “deemed-to-satisfy” guidelines that ensure compliance with the NBR, but has a mission to share information that will help improve the general standard of building in South Africa – particularly residential housing and owner-built houses. Prior to this, on November 25, SANS10400.co.za had already notified the Somerset West-based Planning Department via email that brickwork was substandard and that concrete stairs inside the house did not comply with the NBR. Unfortunately by the time the building inspector got to site, the gable wall had been plastered and this shocking brickwork remains part of the structure. 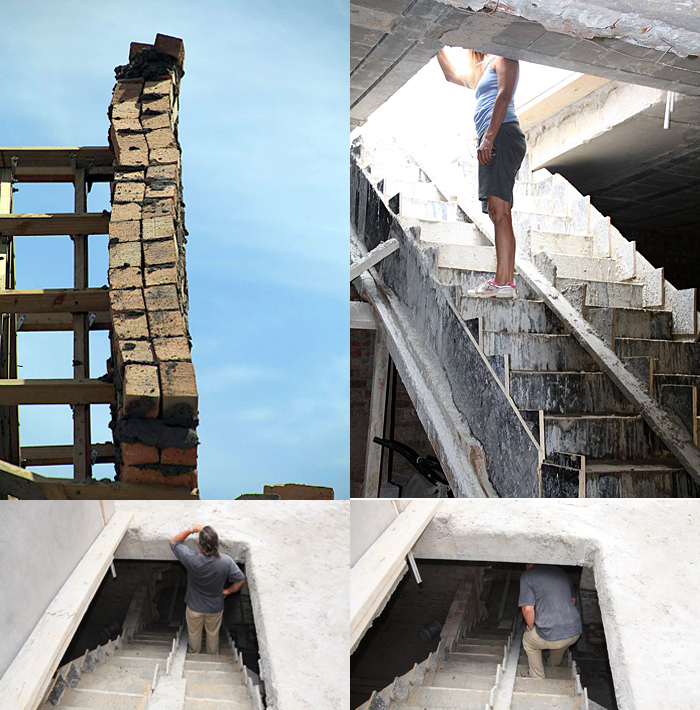 A large portion of the concrete floor slab had to be demolished to allow sufficient headroom to comply with the NBR and allow people to use the stairs. We also pointed out that illegal scaffolding had been used, but that this had been rectified and compliant scaffolding was in place. In fact the building inspector had been notified a month before this (on October 24) and he had notified the Department of Labour which is responsible for Health and Safety on building sites. But no action was taken. Instead, it took a Facebook discussion that drew the attention of Department of Labour manager, David Esau, to get results. 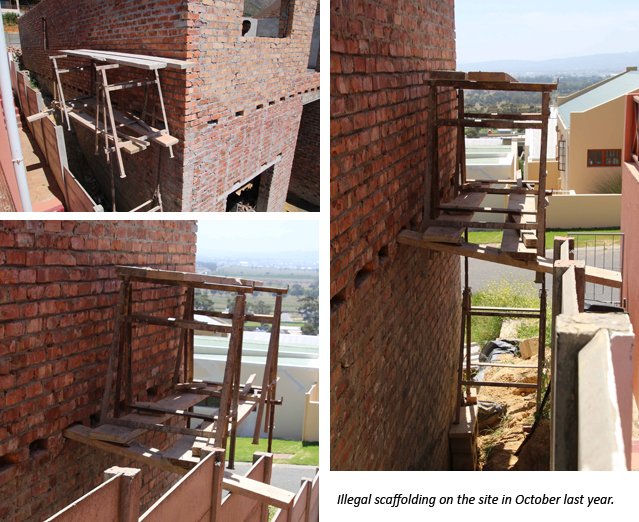 Mr Esau immediately visited the non-compliant site and stopped all activities; and the builder was forced to use scaffolding that complied with the relevant South African National Standards (SANS). I also pointed out that we have numerous queries and complaints via this website every day and that I was sure he would agree that this was the type of scenario that needed to be avoided at all costs. The owner’s engineer was not able to inspect the foundations of the building because he was not notified – and he only did the inspection AFTER excavations and construction work were completed. I asked for proof that council had inspected the foundation trenches as required by the NBR (which has not been supplied) and said I knew that the owner’s engineer had threatened to resign from the project at this stage. There had already been a wall collapse on this site (in October 2014) – of the very same gable wall as shown in the pic (above) and I knew council was also aware of this. The authorities had to be called in to force the builders to use scaffolding that complied with the regulations. (Oct 2014) and I said we were aware this was a health and safety issue. By law all commercial builders must be registered with the NHBRC, so I asked if this had been checked. “I do not believe that the builder is registered with the NHBRC – which would make him an illegal builder. Has council checked whether the builder and house are registered with the NHBRC? I know this is not your function, but in the circumstances I believe it is something that you should have done – or if you haven’t done it, should do. “I also suspect very strongly that whatever plans have been lodged with council do not match what is being built. I have had contact with a tradesman who only last week was asked to quote on work to be done on the building – and the owner/builder was not able to supply plans for him to quote off. Their explanation was the plans they had did not match the building. The roofing contractor was on site that day, but the next day (December 10) all work had stopped. The portable toilet, which, in terms of the NBR, must be on site during building operations as well as the rented scaffolding were removed. 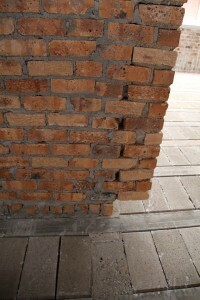 On January 12 work resumed on the roof, but once again the regulations were ignored. As a result SANS10400.co.za notified council that there was no toilet and no scaffolding on site, even though the roofers were working. A week later Mr Visser notified SANS10400.co.za that the senior building inspector who had been dealing with the matter was no longer “in this office,” however both the builder and “appointed structural engineer” had been asked to “immediately act on matters” the building inspector had previously identified. Roof work was halted, and at present the site is deserted. 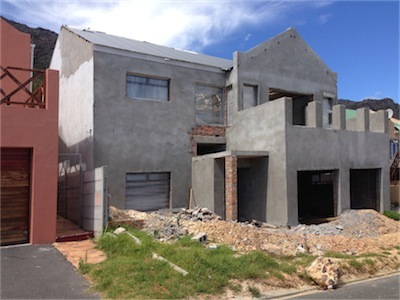 Ironically, this time last year the City of Cape Town threatened legal action against the owner of this same property. This followed an inspection of the property by the council, that revealed excavations had undermined a neighbour’s boundary wall and might have destablised the neighbouring property. Mr Visser said he was not able to comment on the non-compliant site unless comments were officially cleared by the City’s media centre. Is there anything that Mr. Visser has told me that I cannot include in my article? Were plans approved by Council prior to construction starting on this site? If so, when were they approved? Are there approved plans lodged with Council that match the house as it stands? If so, when were they approved? Since there were clearly no plumbing plans as of December 2014, are there now approved plumbing plans. If so, when were they approved? How is it possible for an engineer, appointed after the fact, to ensure “the structural integrity of the building,” since the foundation trenches were never checked? If I am wrong in this regard, can Council supply proof that the trenches were checked as required by the NBR? If so specifically, when were they checked and by whom? Was the concrete mix checked and did it comply? Since the brickwork is highly suspect (I have pictures taken this month that show bricks coming loose from walls and falling out – which I will use in my article), has there been any attempt to check the mortar mixes being used on site? Has the concrete stairway been checked by Council since the instruction was given to demolish certain sections of the structure, and does it now comply with the NBR? I understand that there was originally a homeowners’ association for this area and that while it is no longer functioning, it is still “registered” with the Council. Is this so and/or relevant? ie Would neighbours have to sign off documentation in terms of the association requirements? I understand someone has been asking neighbours to sign documentation related to the association and acceptance of building plans. What is the time frame allowed for completion of this house? I understand that building has been going on for about two years. In light of the fact that building has been going on for so long, and there have been so many problems, surely Council should have been watching more closely to ensure that building standards were improved and compliant with the NBR? Following on from this, I presume that Council needs assistance from the public in identifying non-compliance? Last of all, does Council ever check whether builders are registered with the NHBRC? If not, why not? On January 30 the City’s senior media liaison officer, Jean-Marie de Waal apologized for not responding to my queries “due to time constraints.” She did though give permission for Mr Visser’s comments to be included in the article. We continue to ascertain that all municipalities require assistance from the public in identifying non-compliance. No but you should notify the council of your intention. This non compliance problem seems tobe growing. My neighbour starting building and extending a house. The council planning department was repeatedly notified and nothing was done about the situation. Eventually, after veiled threats about getting a lawyer involved the inspector visited the house and issued a notice to stop all building as itwas an illegal structure. Now a few weeks later buildinghas resumed. The same inspector said that permission had been given to continue building. I requested further details form the inspector since I understand that no inspections had been done regarding foundations and that a formal public notice of intent for the purpose of the construct was ever made. I have had no response from the municipality inspector. Under the regulations, I thought that a notice of building intent should be fixed in a prominent position on the fence of the property to notify neighbours? I am wrong in assuming this requirement? We have been watching a similar scenario where certain building issues are being sidelined. One involves the construction of a raised walkway (without plans) into the boundary line where building is not permitted. Also no neighbour’s consent has been given. One of the neighbours has complained numerous times and while the council tries to ignore the complaints, they did eventually send a building inspector who agreed that the building regs had been breached. The very next day the neighbour received an email from council to say that everything was in order. The one idea that comes to mind is bribery! However this is almost impossible to prove. Regarding fixing notices to fences – that is not a building regulations requirement. However you neighbour DOES require plans to extend a house and you are totally within your rights to demand to see these. Neighbours can only object if a waiver of some sort is required – e.g. building closer to the boundary than allowed in the local authority zoning regulations, or going higher than allowed. However if you are aware that building regulations are not being followed – including building with no plans; no inspection of trenches etc – then you can insist that building is stopped until the non-compliance is rectified. Keep phoning and emailing and going into the council planning dept. It’s likely to be the only thing that will work. It would be interesting to know which area this is? WHO IS THE BUILDER… ?? Shocking waste of consumer monies…& risk to people’s safety.